Mahamudra and Dzogchen: Thought-Free Wakefulness By Chökyi Nyima Rinpoche. It's posts like this that makes me think I need to start FriendFeed. I've gotten a job and I'm not going to be able to blog as much as this blissful 2 months of unemployment allowed for. There's a fascinating article I found on Integral Options Cafe by Thanissaro Bhikkhu about egolessness, which compares it with western psychological ideas. He doesn't attribute John Welwood to the idea of spiritual bypassism, but we can fogive that. I downloaded the PDF (couldn't find the original source page). Interesting. While I don't think that top Buddhist teacher's health egos proves that nobody from the east needs therapy, only Buddhism, I do agree with this suggestion: "One way would be to read the ancient texts with new eyes. Instead of assuming that the not‐self teaching is counseling egolessness, how about assuming that it’s part of a regimen for developing a healthy ego?" This is also interesting: "As for the concept of not‐self, the Buddha would advise using it whenever unskillful attachment to things or patterns of behavior got in the way of your happiness. In effect, he would have you drop unhealthy and unskillful ways of self‐identification in favor of ways that were more skillful and refined." Finally, "If you open your mind to the idea that the Buddha was actually advocating ego development instead of egolessness, you see that there’s nothing lopsided or lacking in his understanding of healthy ego functioning. In fact, he mastered some ego skills that Western psychology has yet to explore, such as how to use right concentration to satisfy the desire for immediate pleasure; how to develop an integrated sense of causality that ultimately makes a sense of self superfluous; how to harness the ego’s drive for lasting happiness so that it leads to a happiness transcending space and time." Now do you need psychotherapy to become enlightened? I don't presume to know what people need, but I have found both of them very useful, complimentary projects and areas of thought. I'm not trying to take over Buddhism with psychotherapy or vice-versa. For me, there is great synergy between the two areas, modes of personal development. I have no problems with Thanissaro Bhikkhu not going to therapy. I've heard there are 11 senses, or a larger number than the usual 5. Here's an article in the Times about a 6th sense. I think everyone has some sensory integration issues. My son didn't like the swing at first, but we learned that swinging helps with the vestibule sense. I was looking at the Buddhist Church of New York City, because I had read Raising Buddhist Children from a father Buddhist blogger of the Jodo Shinshu persuasion. And I found this video of Reverend T. Kenjistu Nakagaki. He gives some brief meditation instruction and teaches some chanting. I have seen him events that collected all the Buddhist organization in NYC. The 8th Level Buddhist suggests that Jodo Shinshu is the most children friendly form of Buddhism. Made me wonder if I should take the boys for a service. 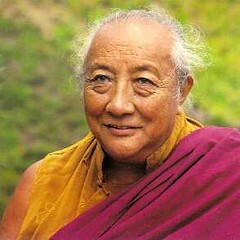 I found an interesting Flickr site, including this photo of Dilgo Khyentse Rinpoche. Lokamitra has an article about him, republished I think, on BNN. I sometimes fantasize about going to India and pitching in with the good work being done out there, in the fights against the injustice against Dalit's or ex-untouchables. Meanwhile I'm trying to establish myself in a career (meaningful and I think right livelihood) to support my wife and small children (another good cause). I hope to travel to India before my children go off to college, but I'm not sure if that's realistic. Who knows, the future is uncertain. Nothing is given. My wife declined my suggestion of living in India for a year. So I wish I could go there and pitch in. I can see the worth of such work. Lokamitra did get there 34 years ago, and I admire him for that. Another friend is involved with the work out there, and more likely so in his upcoming retirement. Another friend, who is visiting soon, has been out there and wrote a book about it called Jai Bhim, which used to be free on Sangharakshita's site, but now I can't find it. You can get it on Amazon. There are 4 copies for a dollar, used, but with s&h it's $5. I'm trying to read The Prisons We Broke, which is described as follows on the website: "Writing on the lives of the Mahars of Maharashtra, Baby Kamble reclaims memory to locate the Mahar society before it was impacted by Babasaheb Ambedkar, and tells a consequent tale of redemption wrought by a fiery brand of social and self-awareness. The Prisons We Broke provides a graphic insight into the oppressive, caste and patriarchal tenets of the Indian society, but nowhere does the writing descend to self-pity. With verve and colour the narrative brings to life, among other things, the festivals, rituals, superstitions, snot-nosed children, hard lives and hardy women of the Mahar community. The original Marathi work, Jina Amucha (serialized in 1982 and published as a book in 1986) re-defined autobiographical writing in Marathi in terms of form and narrative strategies adopted, and the selfhood and subjectivities that were articulated. It is the first autobiography by a Dalit woman in Marathi, probably even the first of its kind in any Indian language." I say I'm trying to read it, because it's like the sun, it hurts to look at such horrors. I'm reading it slowly. If you want to donate money to what I consider a worthy cause, check out the website of Jumbudvipa. I don't know what they would do with American money, they only have ways of giving in India, England and Taiwan, but I'm sure they'd cash a check. When I get out of the red, and we're in a position to be giving away money again, I hope to test that theory. To get one small sliver of some of the negative stuff going on there with caste based oppression, check out the blog Atrocity News. I dare you. I like the way Thurman talks about not being enlightened, but still getting something out of being a Buddhist, in this video. An interesting slide show in NY Times about San Fransisco Buddhist tourism. No FWBO, but still interesting. Also, an explanation of the "fat Buddha". Rev. Danny Fisher has a good post on the Vimalakīrti Nirdeśa Sūtra, whith many good references. Here's a list of my favorites and recommentations, not by Sangharakshita, from the FWBO archives at Free Buddhist Audio. (I've listened to most of Sangharakshita's talks. I don't even want to do a top 15 of his talks, just go listen to them all in chronological order.) This might just be a testament to my spiritual immaturity, that I don't appreciate a talk, so if you're not on this list, don't worry. None the less, I often recommend talks here, so I thought I would just list my favorites as of today. This list may change. 1. The Dharma and Denial by Manjuka. I create a false spiritual self, and this talk helps me to see past that to be more true and authentic. 2. Vessantara is a leading teacher in the FWBO. He takes us with him on some of his journey in a talk called Learning From Tibetan Buddhism. There's a lot of talk about seeing teachers outside the FWBO and this is an exploration of that. Note he consults with Sangharakshita and he's always given him permission. 3. Kamalashila has a blog. He's got many good talks and some meditation lead throughs. I recommend this talk: Our Work as Teachers and Practitioners. Following on #2, this talk suggest you devote 10 years to your school of choice before you branch out into other schools. 4. Any of Parami's 4 talks are great, but to pick one, Energy at it's Most Abundant. She has visited NYC several times and given very inspiring Dharma talks. I think she could have many more than 4 talks, but alas I'll be grateful for what I can get. 5. After Sangharakshita and Subhuti, Padmavajra has the most talks on Free Buddhist Audio. And the most at Padmaloka site, for that matter. To pick a favorite, I'll say listen to this one: Talk 1 on the Diamond Sutra: Taking Mind to it's limit. There are 10 which can be found here. He's a very good speaker, I really recommend all his talks. 6. I haven't yet met Viveka outside of talks and reading her writing (unfortunately sparse at this point), but my friends say she's awesome. Listen to Mindfulness as Sadhana. She also has some great meditation lead throughs. 7. Dhammarati is an awesome dude. Here's Breaking the Mould. When he speaks, people listen. He's got another talk as well that is very good. 8. Subhuti has the second most talks. I like the mind training text, and found his deep discussion of it, with his incisive mind to be illuminating: Eight Verses for Mind Training. See all 4 talks here. I listened to these a few times before they started to really click. He's a deep man, listen to his talks. 9. What Self, What World by Chistopher Titmuss. This talk encourages and exemplifies engaged Buddhism. He's also quite funny. 10. Violence and Emptiness by Suvarnaphraba. This is fundamental to me psychologically like talk #1. A personal favorite. She's also very quirky and funny. She's come to NYC too, thank you Savarnaphraba. She has a blog. 11. Manjuvajra has two scary deep talks. Listen to his talk on Ethics, and get a feel for depth in the spiritual life. Ditto for his other talk here. He also has great talks on, in my opinion, the second greatest free talks site at Padmaloka. But to create a favorite 10 there is another blog entry for another time. Go check them out, they are of a high quality. 12. Ratnaguna has two awesome talks. His last one we listened to on practice day. He's a study leader in the FWBO and a had depth. Standing on emptiness is an awesome talk. I have probably listened to this talk the most of all of them, in part because of the depth and in part because she talks softly. Well worth the effort. 14. Touching The Void is a cool talk. I haven't seen the movie or read the book, but after this talk you don't really need to. Awesome. 15. This talk on Padmasambhava is not for all, but I really like it. I'm probably going to remember some cool talks after I post this, but I don't want to work on this any longer. I'll just add them in comments. Please feel free to add your own in the comments too. Finally if you want a walk through the Noble Eight Fold Path here's some talks by Smritiratna at the Edinburgh Buddhist Centre site. Usually this is a great site that points out the use of Buddhist images in advertising and body vows, tatoos. But he's recently begun to add altars, which are fascinating as well. Thank you Worst Horse. How To Be Happy by Lama Zopa Rinpoche is packaged as a gift book. In a way it's hard for me to imagine how a book that exhorts you onto the path towards Enlightenment as a gift you give someone, like a box of chocolates, but actually, it is a gift. Just not the sweet confectionery kind. It might just be the best possible gift. The irony is that this book was published with the support of the Hershey Family Foundation, a foundation with $65 million in assets, giving out $3.2 million in grants by the end of 2006. Is someone in the Hershey family a Buddhist? Or sympathetic to Buddhism? That is so cool. With the profits of sweet confections, comes the Dharma confection. The exuberance which the teachings are taught is perhaps sweet. This book is more like mind training verses, it's not consolation it's exhortation. Go meditate! The project of turning around in the seat of consciousness is huge. To suggest that ordinary pleasure is a trap, isn't consolation, it's confrontation of the highest kind. To challenge our ordinary approach to pleasure is truly revolutionary. This small hardback is the kind of book I put in my car for when I'm waiting for someone, or in the bathroom, for a daily brief reading. It also might be a good book to read at the park while your kids play. This book is presumably a collection of quotes from Lama Zopa Rinpoche's talks, since it's edited by Josh Bartok (who seems to have studied in the Zen tradition mostly) and Ailsa Cameron (who from what I can tell on the web is a journalist and editor and seems to be involved with editing for Wisdom Publishers and FPMT, where in the latter she's affixed "Venerable". She must have taken a special ordination, and perhaps is a teacher.). The book is published by Wisdom Publishers. The quotes are inspirational quotes which suggest the project of spiritual development through meditation and reflections on suffering. While most of them move me, the references to reincarnation don't motivate me. For me this book is 99.9% inspiring. The book makes me ask questions. For instance, "Each of us is completely responsible for the happiness of every other being. Each of us has this universal responsibility. It's completely up to us. When you work with your mind, what you are doing is real, ultimate solution for world peace--and not only peace on earth, but for all the being in all the numberless universe." (p.33). This reminds me of a talk by Christopher Titmuss on Free Buddhist Audio. As the Wikipedia entry on the link of his name suggest, he promotes engaged Buddhism. In his talk he suggests that it is not enough to just try and change yourself. You need also to try and change the world. I feel of two minds about this. On the one hand, I do think one of the kindest things you can go is to set your own house in order. On the other hand, I think you need to work to act on the world to make it a better place, apply your insights and try to work externally in the world. To be honest, I'm not so great at that. While my work is on the good end of the spectrum of right livelihood, and I work hard to raise my children well, I have not been very political or community oriented. Growing up with parents who marched for peace during the Vietnam War, I romanticize working for social justice. More than romanticize, I think it is important. I have worked in a soup kitchen briefly. I suppose it's an unanswered koan--what will I give to the world? In the FWBO the model is to teach meditation and build a center, and create team based right livelihood businesses, develop spiritual friendships and perfect your generosity. The quote indicates the connection between working on the inside and working on the outside. Is he collapsing just working on yourself as helping the world? I don't think so. I think from self development flows helping out the world. It's always a balance. Later he says, "When we feel compassion for a person or an animal--any being at all--we wish that being to be fre from suffering. When our compassion is strong, we don't simply wish for this but actually do something about it. We ourselves take responsibility for freeing that being from suffering." (p. 37). This is why compassion is so overwhelming for me. When you realize the suffering of other people, it implies some action. Very quickly I am overwhelmed. From one person, to family, to community, to city, to state, to world. Woof. Challenging stuff. There are many interesting quotes in the book, I could bloviate further. Go out and buy it. It is thought provoking and inspirational. Not all Dharma books are intense books you read in a quiet place. Some have short snippets that you can read in the odd moments of a distracted worldly life. Reading A Concise History of Buddhism by Andrew Skilton, who's Buddhist name is Sthiramati, is interesting because he summarizes in a way I have not read yet--by countries. I guess I never get tired of these one book histories of Buddhism. This one is only 200 pages but it's dense. At times I wish he would go into things more. I haven't been able to read about Pudgalavadins, which is a school that asserts an essential self that only gets uncovered when someone is enlightened, and he contains a small section on them, which I greatly appreciate. This school is a kind of reaction to the no-self Dharma. No-self ideas are counter intuitive to me. Of course I think we do need to discover ourselves to transcend ourselves, our small selves, that working for others is the best thing we can do, and that there's less self about as you become more mature. The more coherent and integrated you are the less likely you will act defensively and are less vulnerable to fragmentation and interpersonal contagion. The no-self doctrine can be misused by people with poor sense of self, and low self esteem. I'm a Pudgalivadan. But I also feel strongly reading books like The Saturated Self by Gergen and The Meme Machine that identity is contingent, constructed. Then there is the whole Buddha-nature ideas. One blogger has a recent post on that. There is some concern that this doctrine is creeping Hinduism and not real Buddhism. I can't really tell whether it is or not. In the news are some India devotional recordings about Asvagosha, go check them out they are free at freebuddhistaudio.com. Richard DeWald talks about his experiences in the FWBO-NYC on his blog, and his ultimate decision to return to Zen. Danny Fisher has a list of Buddhist movies. You know how Buddhists love lists, and I'm no exception! Check out this post on mudras! I love it! I don't think I'll use them myself at this time, but I am so interested in this. Here's an article about an Australian Buddhist-Therapist. Cool beans! Here is an interesting article on mindfulness of eating. BNN has an article on Dalit experience. Finally, I'm going to be doing more book reviews, so watch out!